I teach this stuff to my AP students…I love trying to get them to understand how to break apart political rhetoric and other arguments around them. I figure even if we disagree wildly in politics or social issues, at least I’ll have an intelligent opponent to argue with someday. I like that, because I fully endorse that approach to life. That’s part of why I wanted to do a blog like this. Quite some time ago, the Assistant Village Idiot put up a post I liked very much (and can’t find now…circa 2007?) about how far too many people treated their political opinions as though they were defense lawyers….never giving an inch, never admitting that anything they had said or cited could be wrong or skewed. This makes lots of people defend really stupid things. I often have fantasies of taking it down during debates and serenely handing it to the other person whilst telling them to try again. Sadly, I have never done this. The fantasy keeps me going some days though, doubly so in political debates. Though I’m probably preaching to the choir hear, I feel the need to state for the record: Just because something you cited is wrong does not mean you are wrong. You can keep your belief while also admitting that something that agrees with you is a load of crap. That actually makes you a better person, not a worse one. This is not an April fools joke, people actually can operate like this. 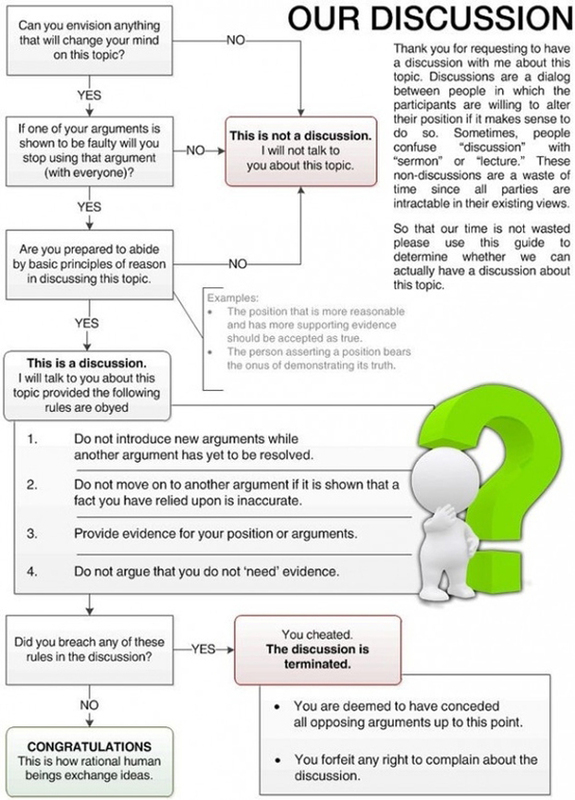 Waaaaaaaiiit just a minute – do these “rules” imply that you are not the worst scum of the earth for disagreeing with me? I've been hanging out on DU this morning, and that seems to be the ground rules for the discussion THERE. It makes for interesting commentary. And a whole lot of jury duty. It's a comment I've made a few times, so you may be remembering it as a composite over a few weeks. I'll see what I can find. Quote over at Volokh today, in the context of the SCOTUS hearing argument on the individual mandate, which was originally dismissed as a long shot by most law profs, liberal and conservative. Using language for “tactical reasons,” at least if done intentionally, seems contemptible.